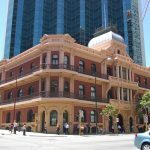 Not only is the Palace Hotel on the site of one of Perth’s oldest taverns, it was also the centre of a heritage controversy when the Commonwealth Bank proposed to demolish it in the early 1970s. Although it has not survived as a hotel, the exterior remains largely intact, and its former glory can still be seen. The Palace was erected in 1897 by an American entrepreneur, John De Baun, on the site of the Freemason’s Hotel. 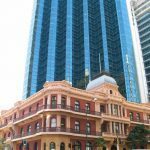 When it opened, it was considered to be the finest hotel in the southern hemisphere. Boasting of marble stairs, electric lights, hot water, and a bathroom on every corridor, no expense had been spared for visitors. 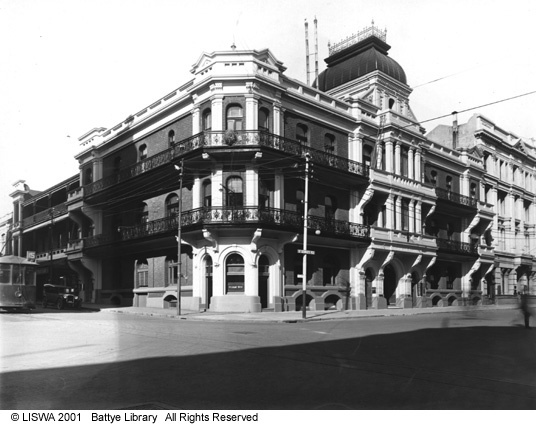 When the Commonwealth Bank bought the place in the 1970s, it was only a hard-fought local campaign which saved the Palace from being demolished and replaced by a modern office building. 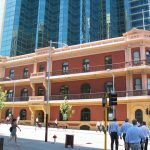 Even so, after Alan Bond’s company took over the property, it was closed as a hotel and much of the interior was lost, or greatly changed, to erect a tall office block behind the façade. 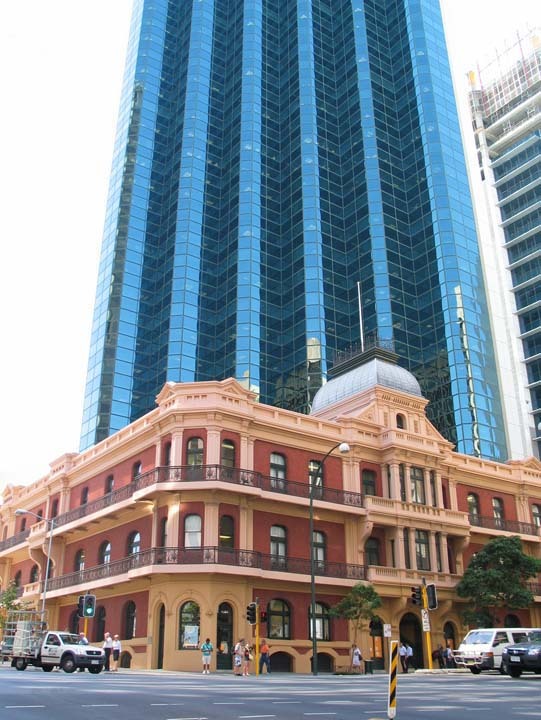 The Palace Hotel was used as a bank until 2012 and today, after a significant restoration, it is commercial office space, while remaining a significant landmark on St George’s Terrace. 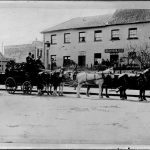 There has been a tavern on the site of the Palace Hotel since 1832, when William Leeder erected the King’s Head Tavern, more popularly known as Leeder’s Hotel. 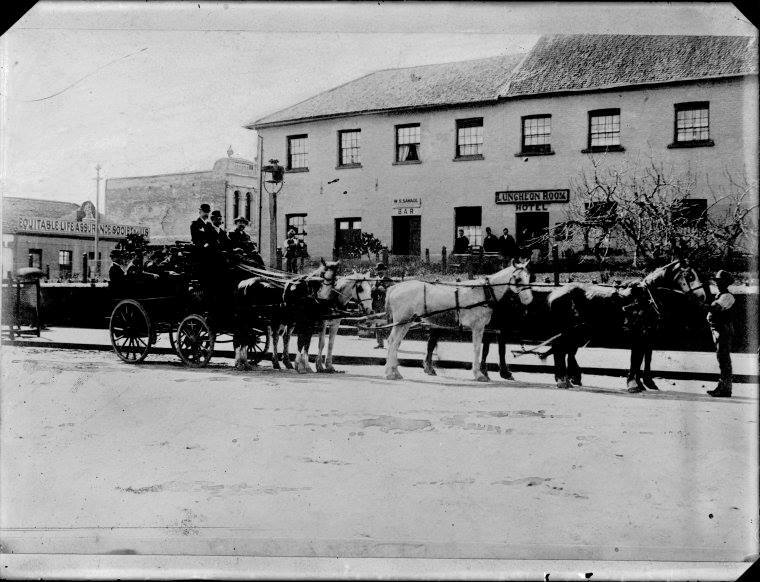 In 1845, Leeder began to make extensive additions to his hotel, which was now renamed the Freemason’s Tavern in honour of housing the first Masonic Lodge in Western Australia. Leeder died at age only 47 that year, after which the Freemason’s was owned by his widow until the 1880s. 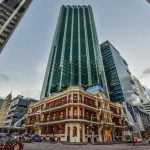 In 1895, American real estate investor and hotelier John De Baun purchased the now-dilapidated property for £14,000, along with several other sites along St Georges Terrace. He ran a competition inviting designs for a new hotel, and that of architects Ernest Saunders Porter and Edmond Neville Thomas was selected as the winner. 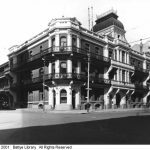 When the Palace Hotel, as it was renamed, opened in 1897, it was widely acclaimed as the finest hotel in the southern hemisphere. Although exaggerated claims were common for new buildings, there is no doubt that the Palace was magnificent. 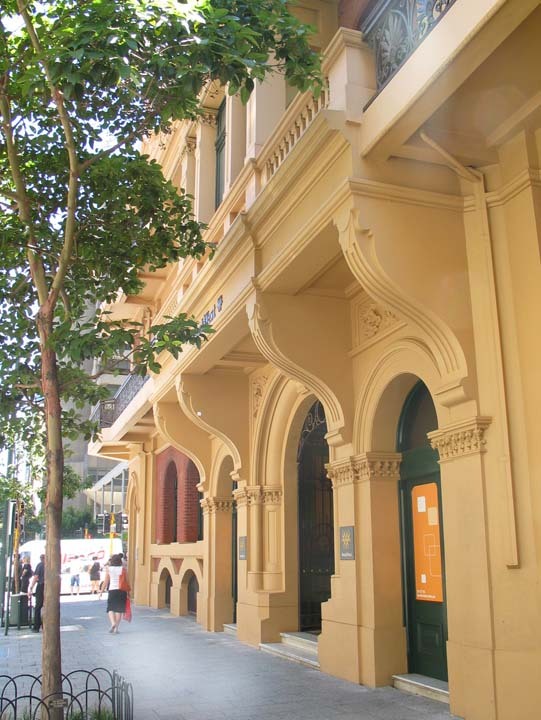 The Romanesque façade had balconies and balconettes, together with a tower rising to a height of 26 metres, marking the main entrance on St George’s Terrace. 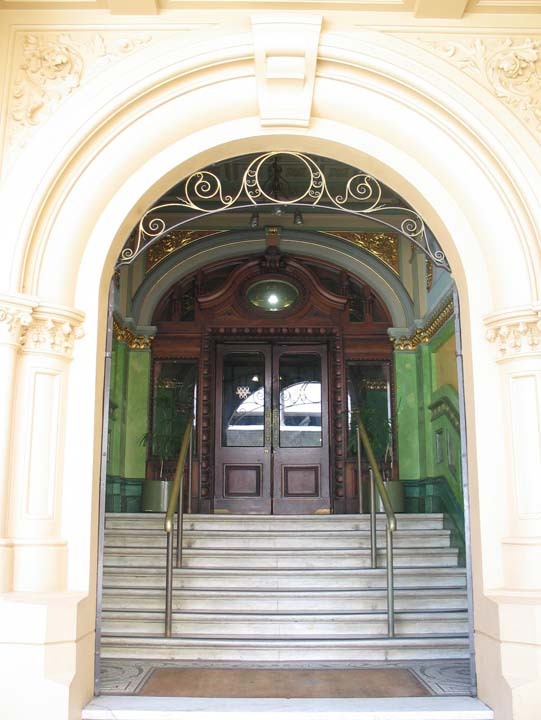 A flight of marble steps, led to a foyer with a tessellated floor and embossed metal ceiling. The foyer led into the main staircase hall, with its inlaid parquetry floor in oak and walnut. At the foot of the stairs, on a marble pedestal, stood a replica of the Venus di Medici, while opposite were busts of Venus and Apollo, while tree ferns were carefully placed everywhere. The decorations of this room are exceedingly tasteful and produce a striking effect upon the visitor. The stamped metal ceiling is of elaborate design and is handsomely decorated in rich tones of steel grey, robin’s egg blue, vellum and terra cotta, the whole being relieved with gold and silver leaf and tinted bronze. The walls are treated in subdued shades of terra cotta, old gold, duck’s egg green, pompom reds and ivory, embellished with handsome scroll work panels, with gold etching and lines; the whole had been carried out in an artistic and pleasing style. The entablature over-mantel and entrance doors are treated in pleasing tints of ivory green and tuscan red, elaborately relieved with gold and ornament. The dado is in heavy ‘Anaglypta,’ treated in rich lines of tuscan red and art browns, relieved with old gold color in varnish. 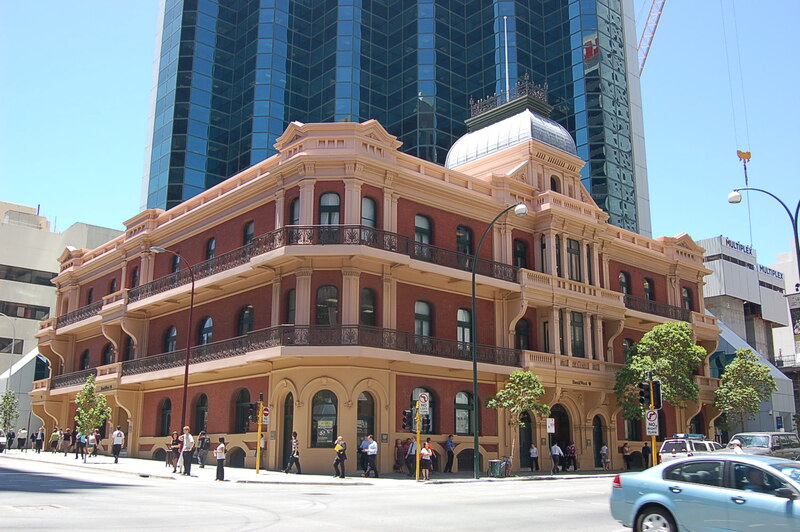 The Commonwealth Bank purchased the Palace around 1972 and announced it planned to redevelop the site as high-rise offices. 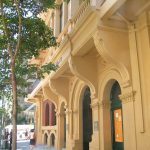 A public campaign commenced to push for the building’s preservation, and the proposal did not go ahead. However, in 1978 Bond Corporation purchased the hotel and in 1980 unveiled plans for a modern office block on the site and the demolition of parts of the Palace. The developers also obtained approval to allow the use of the Palace as a bank, rather than remaining a hotel. The Palace Hotel closed in June 1986 for demolition works and the project was completed in 1988, being officially opened in August 1989 by Premier Peter Dowding. The redevelopment entailed demolition of most of the interior walls, although the exterior façades facing the two main streets remained largely intact. 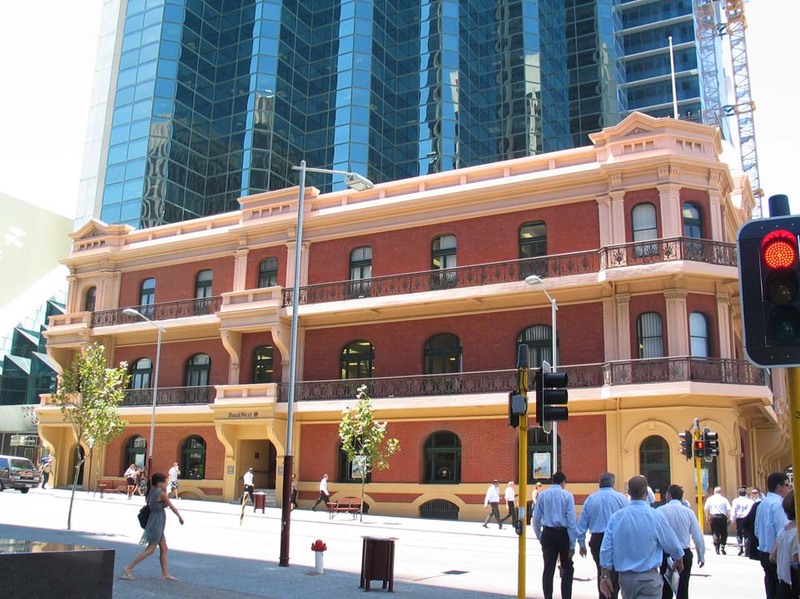 The former hotel was used as a bank until Bankwest moved to new offices in 2012. In 2016, architects Woods Bagot undertook a restoration of the Palace to highlight the remaining internal features, including fireplaces, tile mosaics and original timbers. 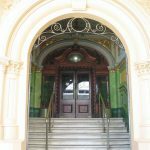 Ironically, given the description of the 1902 dining room above, the 1980s’ decorative work including marble and gold flecked features, were seen as inappropriate for a heritage building and stripped back. 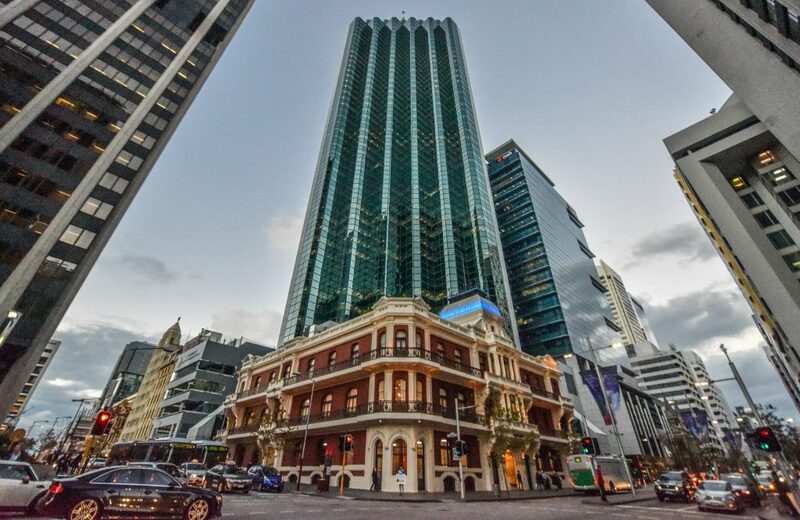 Today, the former Palace Hotel is known as 108 St George’s Terrace and is occupied as commercial office space.